I don't really know is it because of the 2nd october that I bought a copy of Mahatma Gandhi's Autobiography "The story of my experimentations with truth". I was at book store and flipping books to decide what should I read next. I was very keen on buying some international bestseller, but I ended up buying Mahatma's autobiography. I think I had it in back of my mind that I wanted to read this book. Few days back I met a guy who was visiting India from Germany, not and Indian and he mentioned Gandhi and how inspiring he is. I was amazed to hear that, a German was talking about Gandhi. Being an Indian I surely know about Gandhi and his contributions to our freedom and building of India, but I never really cared to read about him. I thought of reading about Gandhi after watching Munnabhai but never really picked the book. Well I finally have the book and I am excited to read it as well. I read somewhere that reading a book is like having a conversation with the author going by that I am having conversation with Mahatma Gandhi these days. I am surely not going crazy like Munnabhai and seeing Bapu everywhere, but wont we all love to have Bapu back with us. Surely this man was strong and had nerves of steel. 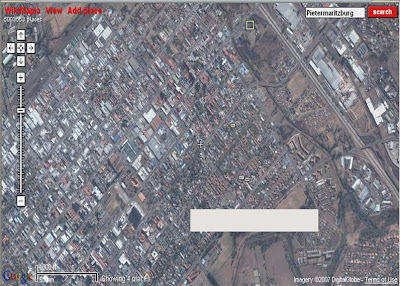 Mahatma Gandhi was thrown out of the train at Pietermaritzburg in South Africa and this is the Google image of the same place. I and the whole of Indian and South Africa must be thankful to officer who did such a shameful thing, but if had not done this we may not have known Bapu as we know of him today. I think that incidence was the catalyst of change and started the spark that lead the conversion of a simple man into Mahatma. I will surely find out more about Bapu during our conversations and will try to crystalize my thoughts about Mahatma Gandhi in coming posts. As it's birthday today, I would like to wish him a very happy bday and thank him for his contribution towards the making of India. We love you Bapu. To end this post I would like to reiterate your words, "In your lifetime if you can save or better someone's life, your birth as a human being and your life is a success". Bapu you have not only bettered so many lives during your lifetime but your ideas are still helping a lot of people in bettering their lives. 2. Wikimapia in search of Pietermaritzburg. i like that connection that was made in ur head to search for the place on google earth, nice.